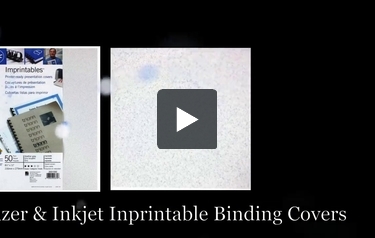 Perhaps you are wondering what an imprintable binding cover is? Well, the sad fact is that most cover options available for reports or documents can't be printed in a standard laser or inkjet printer. Often they are too thick, too dark, have too much texture or are coated with materials that won't allow ink to adhere. These imprintables options are chosen to eliminate those problems and are guaranteed to be laser or inkjet compatible. Now you can print your title or logo directly on the cover of your report and bind away. You still may want to add a clear sheet to the front for protection or something thicker to the back for rigidity. However, the choice is yours. This is MyBinding video. Are you looking for laser and inkjet inprintable covers? You’ve come to the right spot. Here at MyBinding.com, you can save up to 80% on these premium covers. With these great inprintable binding covers, you can now use your inkjet or laser printer to easily print high-quality customized report covers, and you can make your selection by brand, style, size or colors. We have lots of colors. Here at MyBinding, we specialize in customized orders so give us a call and we can make it happen for you. When image matters, MyBinding.